These lovely girls ornaments personalized from Russell Rhodes hit all the right notes! 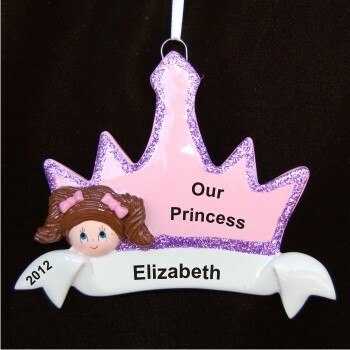 The colors of the brunette girl princess crown personalized Christmas ornament are very feminine and the sparkle outline of the crown enhances its appeal. We'll add the custom information you provide to the crown and banner in an attractive, handwritten style - not the plain print shown in the photo for clarity. These nicely designed resin kids ornaments personalized to be special mementos from childhood arrive in our plush and pretty velvet gift bag. Let your daughter or granddaughter know how special she is with the princess brown hair personalized ornament for any occasion.